A year ago today, I got the phone call that my grandfather had passed away. He lost his battle with lung cancer after fighting a long, hard fight. I remember it like it was just yesterday. And I could never capture those thoughts or feelings any better than I did last year on my old blog. To read that post, go here. But today, I don’t want to re-live that awful day and the ones that followed, burying Pops and knowing I’d never hear his laugh again or hear him say that he was proud of me. Instead, I remember all of the joy that he brought into my life. He was such a strong man, and he impacted many, many lives, including my own. He was one of the strongest people I’ve ever known, and I will definitely never forget him. Ever. I loved having him in my life and being able to be a part of his, no matter what little task we were doing. And his love for his bride was one that I dream of. Seeing him and granny picking on each other in the kitchen or watching tv was absolutely priceless and will be forever ingrained in my memories. Those were two very stubborn people. But they always would give each other a kiss and move on about their day. They had a fierce love up until the very end. He also had a steadfast love for the Lord, and I truly cherish that about him, and Granny. They would pray the rosary every single night together and would always attend church. They prayed before every meal and thanked God through the hard days, for each other and the blessings they had in their lives. This picture is one of my absolute favorite pictures of all time. Although he was going through probably the hardest time of his entire life of grieving Granny’s loss, he showed up for me. 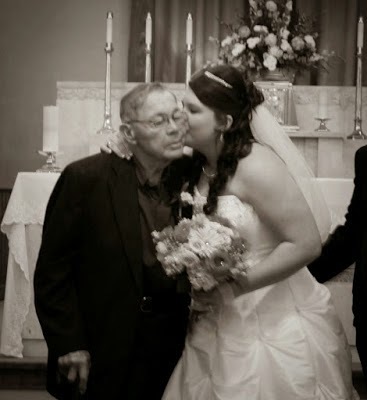 He found the strength to be present at my wedding even though the love of his life died just five days earlier. He was hurting, but he did it for me. It’s a feeling that I’ll never forget, knowing how badly he was in pain but he was persistent on being there that day, for me. I have so many characteristics that I get from Pops, and I’m proud of it. I’m stubborn. I’m a hopeless romantic. I’m a farm girl at heart, and will always be no matter where I live or what I’m doing. I’m also faithful in my relationship with the Lord, and I know that both he and Granny are with Him, without worldly pain and suffering. Although it’s hard to live without them, having the memories that I do of growing up right next door to them eases the pain. I can look back and laugh at the countless goofy things they were doing or saying, knowing their love for their family ran deep. Pops was one of the best people I’ve ever known, and he got along with pretty much everyone. And because of that, he is missed dearly. His strong hands, huge heart, and goofy laugh … those are just some of the things that I hold on to. Pops, I miss you deeply. But I know you are in a much better place, and I look forward to seeing you again one day. I’m happy knowing that you’re with your Savior and your bride, at peace and no longer with any burdens or pains. I love you, forever. Thank you for being an amazing role model to me and my siblings, and for showing me what unconditional love really looks like.